Beautiful 1 bedroom condo overlooking the Herzeliya Marina and the Mediterranean Sea,just 2 minutes walk to beach restaurants and shopping mall.The newly remodeled condo features spacious living room with kitchen and dining area,bedroom,lots of storage and private balcony with spectacular in secured building with 24 hours security and reception, gym, pool, laundry room, elevator and secure covered parking.Enjoy everything herzeliya has to offer while being conveniently located close to major highways and only 20 minutes from center of Tel Aviv,easy access .You will love it as much as I do. Comfortable, clean and well located. Amazing location! Amazing view! Wonderful stay! Eitan was extremely helpful during the reservation process, and his family member met us at the apartment for check-in and provided a great tour of the complex. The highlight of this apartment was the location and the view! We watched the sunset every night with the boats going in and out of the marina. Clean and furnished apartment. Parking under the building. Walking distance to the beach and restaurants. Exactly what we needed. We plan on staying here again for our upcoming visits to Israel! This apartment was very clean, modern and well furnished with everything you need. The underground parking and an easy access to freeways is a major bonus. We hope to come back soon and have already recommended it to our friends and family. Amazing Place with Amazing Views! I stayed in the apartment this summer with my kids and it was the best decision I made. Great house with the most beautiful views. Perfect location. Great host who was so easy to coordinate with. It was an absolute pleasure to stay and I will definitely be returning. Beautifully appointed apartment, with great view of the Marina. 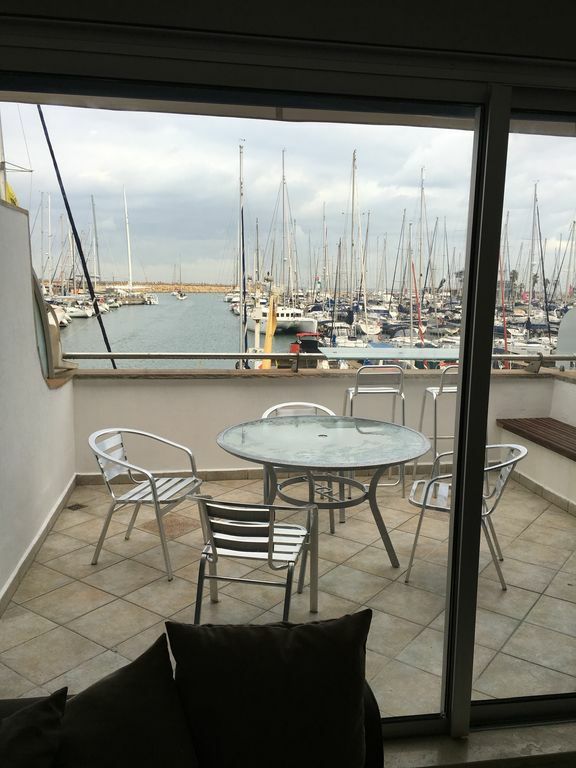 Great first floor apartment, all updated with nice comfortable bedroom and nice terrace overlooking the Marina. The swimming pool is great and the parking in the underground garage is very convenient. The owner is very accommodating and easy to deal with, and will take care of all your needs. The beach is wonderful and within a 5 minute walk. One of the best supermarkets in the Tel Aviv area is right in the complex and is open 7 days a week. Plenty of restaurants in walking distance. This popular tourist destination can get a bit noisy on weekends, but we got used to this during our stay, so I would not hesitate to stay here again. All in all this is a wonderful choice if you want to experience a real holiday on the beach in the Tel Aviv area. We had a car, but we also used the buses right in front of the complex running to Kfar Saba and to Tel Aviv quite frequently. we stay at the condo next to the beach at Herzelia. we had great time. the place was nice and clean, comfortable , great location, easy to get in and out, near the highway. closer to the beach/pool/ shopping/food. private free parking. we had great time, we are planning to come back.